Literature is a group of works of art made up of words. Most are written, but some are passed on by word of mouth. Literature usually means works of poetry and prose that are specially well written. There are many different kinds of literature, such as poetry, plays, or novels. They can also be put into groups through their language, historical period, origin, genre, and subject. The word literature comes from the Latin word "learning, writing, grammar". Most of the earliest works were epic poems. Epic poems are long stories or myths about adventures. Ramayana and Mahabharta, two Indian epics, are still read today. Odyssey and Iliad are two famous Greek poems by Homer. They were passed down through speaking and written down around the 8th century BC. Literature can also mean imaginative or creative writing, which is looked at for its artistic value. 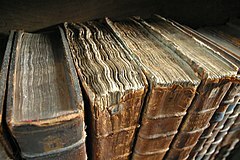 ↑ 1.0 1.1 "literature -- Britannica Online Encyclopedia". britannica.com. http://www.britannica.com/EBchecked/topic/343579/literature. Retrieved 26 June 2010. ↑ "Online Etymology Dictionary". etymonline.com. http://www.etymonline.com/index.php?search=literature&searchmode=none. Retrieved 26 June 2010. This page was last changed on 16 November 2014, at 20:03.